Many places received the first snowfall of the season as storms rolled through the northwestern U.S.
Parts of the western U.S. got up to 21 inches of snow over the weekend and early this week. Snow fell over the higher elevations of the region. Timberline Lodge was open earlier than normal for skiing due to the fresh powder. Typically, they open in late November. "An early snow is not necessarily an indication of a snowy winter," AccuWeather Meteorologist Tim Kines said. For the past eight years, Timberline Lodge has gotten their first snowfall in November. "Meteorologists are expecting a stormy start to the winter season, but the second half of winter will bring less storms and less snow," Kines said. Meteorologists say it will most likely not get cold enough for snow through late week at Timberline, but there will be additional opportunities for accumulating snow soon. "Another round of accumulating snow is possible later in the weekend or early next week," Kines said. "The upcoming snow will be in no hurry to melt as temperatures over the next several days will be close to or below normal," Kines said. Snowboarder Kyle Skutch is excited for an early start to the season. "Last year, my first day of the season was Nov. 4. This is definitely the earliest I've ever gotten to snowboard with new snow," Skutch said. "It is unusual that we get this much snow this early and I would love to see the snow stay! Bring on the winter!" 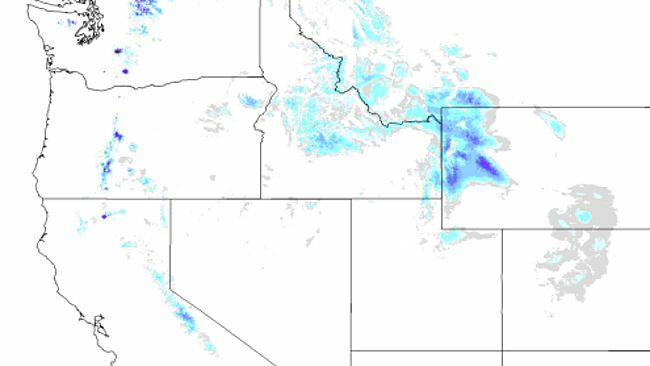 Although Timberline made the headlines, many states in the West got their first snow this week. Lincoln County, Wyoming, received a whopping 21 inches, and Mount Rose, Nevada, came in slightly below at 18 inches of snow.